Summer is here, which means that dreaded A/C bill is about to increase. The summer months tend to be the most expensive during the entire year, especially if you live in the southern states. The A/C is a wonderful invention, but it comes with a price. 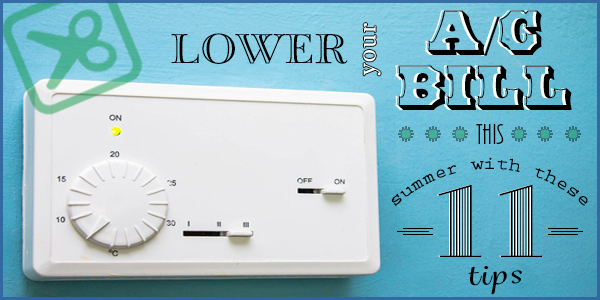 Follow these clever tips so you can stop stressing and lower your A/C bill today! On average, you can reduce your utility bill by 4% for each degree that you keep from your thermostat. So when leaving the house, turn the thermostat up a few degrees so you’re not cooling the entire house just for the cat and dog. When it’s cooler outside at night, leave windows open to create a draft in the house, so that you can turn the A/C off. When you wake up in the morning and it’s cold, put a sweater or jacket on. It’s better to be temporarily cold and saving money, than shutting the “free” cold air out just because you’re uncomfortable. Also, as soon as the outside air becomes hotter than in your house, shut all of the windows. Optimal fan placement is key to saving money. It takes much less energy to turn a fan on, than it does to cool the whole house with the A/C. If you don’t have a fan in every room, it’s highly suggested that you get them installed. If buying fans is out of your budget, then simple floor fans would suffice to keep the air moving and cool. It is also important to make sure that your fan is rotating the right way. Generally, having your fan spin counter-clockwise will push air down creating a cool breeze, which is what you want during the hot summer months. If you have multiple rooms in your house that aren’t being used every day (such as the guest room), shut the doors and vents to those rooms. With fewer rooms to cool, the A/C can work less to cool your home. If you are noticing that hot air is seeping into your home by the cracks in your windows, seal it with caulking. If you see that heat is coming in through the bottom of your door, roll up a towel or old shirt, and shove it into the crack to keep the heat from coming in. Regularly change or clean your air filters. Not only will this keep your air clean in the house, but your A/C won’t have to work as hard to push the cold air through dirty filters. Hang blackout curtains over the windows to keep the majority of the heat out. Not only will this save you money, but it will allow for a great nap! Depending on the direction your house faces and the time of day, the sun can accumulate heat on the entry door into your house, letting heat fly into the house when you open that door. If you have another entryway to go in and out of the house, use it instead of the door being baked by the sun. It’s obvious that energy-saving light bulbs can save you a lot of money on your electric bill, but they can also be very expensive. To help reduce this expense, make sure that your halogen and incandescent lights are off during the evening. Not only do they use quite a bit of electricity, but they generate a lot of heat that can deplete the cool air in your home. Try and eat lighter meals, like salads and vegetables, with less red meat. This may sound strange, but eating beef and pork makes our bodies hot, thus we want to turn the A/C up after we eat. Opt for lighter meals throughout the week to save on your A/C bill and to also feel healthier and fresh. The two appliances that probably use the most electricity in your house (besides the A/C) are the oven and dryer. The oven adds a lot of heat to your home, thus making the A/C work harder. Try to grill outside more, rather than cooking on your electric stove. And when possible, hang your clothes to dry instead of tossing them into the hot, electricity-burning dryer. Hopefully you and your family can use these tips to your advantage in the never-ending battle of saving and spending. As said before, A/C is a blessing, but it comes with a price. Use these tips to lower your A/C bill and enjoy a night out with the money you saved!